There’s a whole lot of weddings going on for Jerry Lee Lewis! The rock and roll piano player and singer has wed for the seventh time, to a family connection. 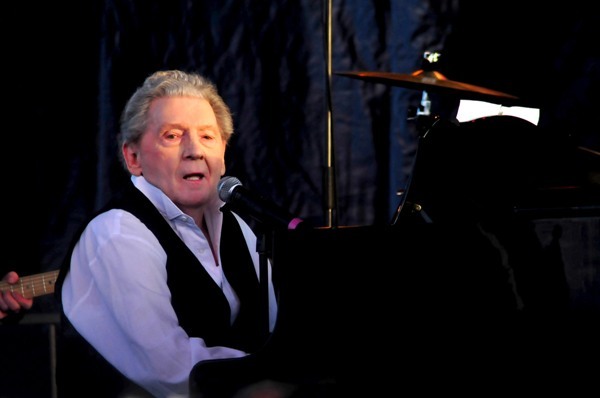 Jerry Lee Lewis has wed his cousin’s ex-wife! The strange but true news the “Great Balls of Fire” singer has tied the knot for the seventh time has been officially confirmed by the 76-year-old’s rep. The family connection between Jerry Lee Lewis and new wife Judith Brown is, perhaps, a little too close for comfort. To start with, she was previously married to the rocker‘s cousin, Rusty. Rusty and Judith lived as man and wife for 20 years and raised one child together before divorcing in 2004. But that’s not all — this isn’t the first time Jerry Lee Lewis has picked a spouse from Rusty’s familial tree. In 1958 it was discovered by the press that the singer, then age 23, had wed Rusty’s 13-year-old sister (as stated by his rep to CNN) Myra Gale Brown. Even though Lewis was still young himself, this was his third marriage. Once news of Jerry Lee Lewis’ teen bride hit the press he was blacklisted from radio, nearly ending what looked to be a promising career. Dorothy Barton: The marriage lasted for 20 months, from February 1952 to October 1953. Jane Mitchum: The marriage lasted for four years, from September 1953 to October 1957. The pair had two children. Myra Gale Brown: The marriage lasted 13 years, from December 1957 to December 1970. The pair had two children. Jaren Elizabeth Gunn Pate: The marriage lasted 12 years, from October 1971 to August 1983, at which time she drowned in the swimming pool at the couple’s home. Shawn Stephens: The marriage lasted three months, from June to August 1984, at which time she died from a methadone overdose. Kerrie McCarver: The marriage lasted for 20 years until a divorce in 2004. The pair had one child. Judith Brown: March 2012 to present! There are conflicting reports on how many children Jerry Lee Lewis has had. Wikipedia lists five when naming his marriages, but also states “at least four.” Two additional people have claimed to be the rocker’s child as well, but have not been able to prove their paternity cases. Is Jerry Lee Lewis’ marriage to his cousin’s ex-wife scandalous in your book?